This is a repeat post from this morning with a correct video – tech issues, my apologies! NOTE: Read to the end of the post for some quick info regarding these techniques with a new product that just came out at CHA. 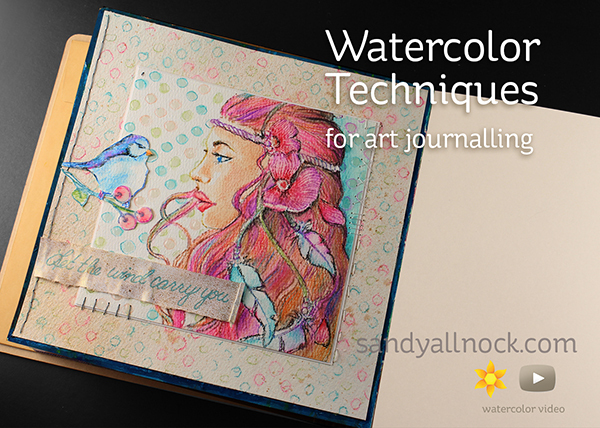 I’ve been wanting to work on a few art journal pages with all the goodies from Prima that I keep buying -and storing. LOL. Anyone else relate? Well after playing with the Oil Pastels during tag week, I knew I was going to get them out to play again! I matched them up with the Prima pencils – which I now have all of, since I suffer from #fullsetsyndrome (can I get an amen there?). Add in some other goodies – and well, here you go…..Watch the video below or click HERE to see it in HD on YouTube! I think the Glossy Accents additions are one of my favorite things about the page…. The sentiment is from the bird stamp set- I stamped it onto plain old typing paper, tore the edges, rolled up one side, then sprayed it with the Prima gold spray (there are a couple gold colors HERE). Shiny and yummy! The stitching was done by hand with plain old needle and thread. Be glad I don’t sew my clothes, ha! I did just random stitching; I glued the panel down really well with 1.5″ Be Creative tape, but I decided a few stitches to tack down everything well wouldn’t hurt. Visit the Prima Booth on Periscope with me HERE! I know the question is hanging in the air since Tim revealed the new Distress Crayons at CHA. I had the opportunity to discuss this project with him, and I wanted to add this note to this blog post: while not addressed in the video, of course, this project could not have been done in this way with the distress crayons. They cannot be used to stamp an image like this. These Prima Oil Pastels are a completely different product with completely different properties, and I’ll be sharing an upcoming project with the Crayons and discussing more of their properties at that time. As I was purchasing pencils – I made an oopsie and purchased an extra set of the “Earthtones” – so I’d like it to go to a good home! 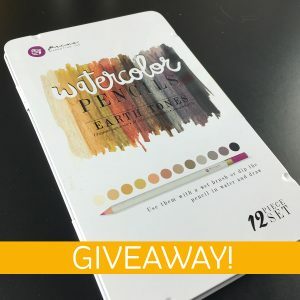 Please comment on this post and tell me: have you tried the Prima pencils? Which set is your favorite? I’m travelling to San Francisco today to go to the Periscope Summit which begins Thursday evening. So don’t expect that your phone will stop ringing quite yet! I know it’s been a terribly busy week on Periscope, and I hope the Summit will be fun for you to join in virtually too. I hope to bring an artist’s perspective to what goes on there – and I can’t wait to see what we can all learn! I am planning to provide a CHA wrap up blog post Friday – depends on internet service and time available, please subscribe to stay tuned! I love your videos, i only use watercolor on tube or cakes (?) It’s interesting the watercolor pencils, i really ganna try.